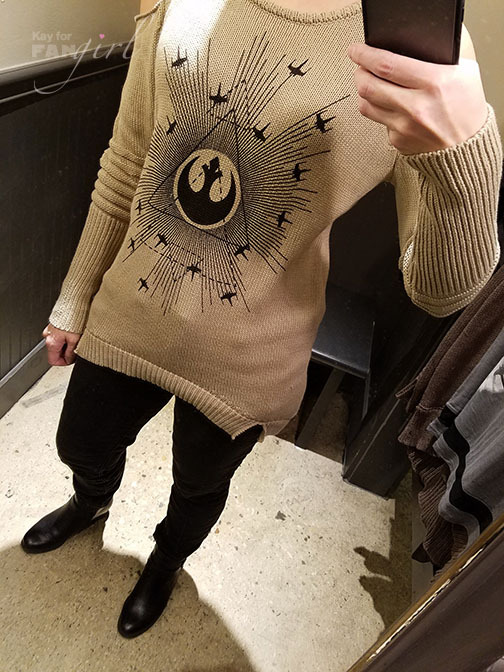 When Hot Topic released the lookbook for their Rogue One fashion collection in December, I have to admit – I was less than impressed. 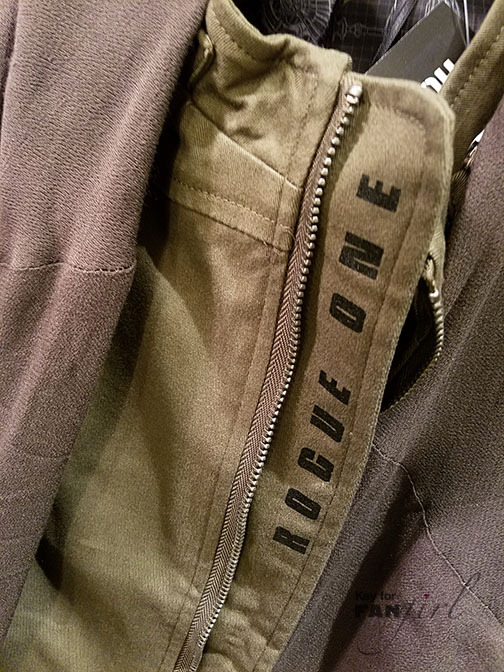 The Rogue One rebel costumes are mostly earth tones and utilitarian and I’d looked forward to how these geek fashion collections could incorporate that – especially after a few seasons in the broader fashion world where military/army was a style influence. 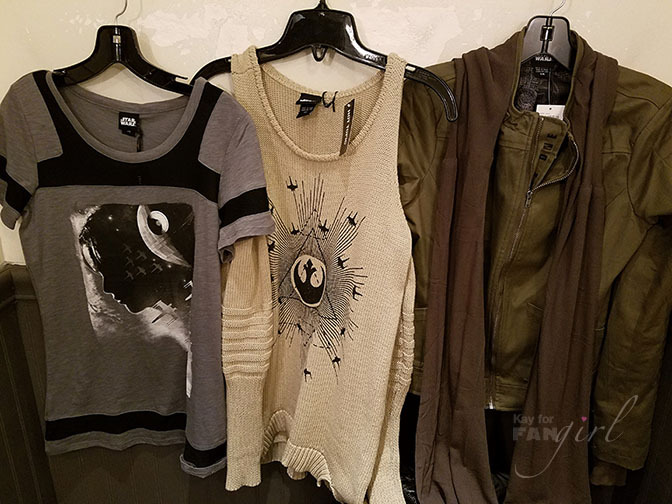 What I’d been seeing from the Rogue One women’s clothing offerings though made it look like it was a challenge to translate the rebel look into everyday apparel. COLD SHOULDER SWEATER: ($49.90 – $58.90) The graphic on this one is one of my favorite released for Rogue One. You’ll find it on a few pieces outside this collection too. The ribbing on the sleeves elevates it from a simple graphic sweater. Every time I see a cold-shoulder sweater though, I think it must have been designed somewhere warm. Although the cut-outs give it more of a relaxed look, It’s really impractical if you spend any of your time in a colder climate. The hem slits seem a design element too far as they emphasize your hips for better or for worse and there’s already a lot going on in this piece. The high-low hem is not too dramatic. JYN OPEN CARDIGAN: ($59.90 – $68.90) This long cardigan looks very blah in photos but better on and in-person. The color is still a bit blah and the suede parts are an interesting choice but the Rebel Alliance-branded buttons are a nice touch. It’s unfortunate you can’t see the cut-out detail at all when the hood is down since it’s big enough to cover the upper back. Being all wrapped up in this cardigan feels nice though. REBEL ALLIANCE FLIGHT SUIT DRESS: ($69.90 – $78.90) I’m guessing this one is a tribute to Bodhi since the rest of the Rebel pilots in the movie aren’t wearing black jumpsuits. 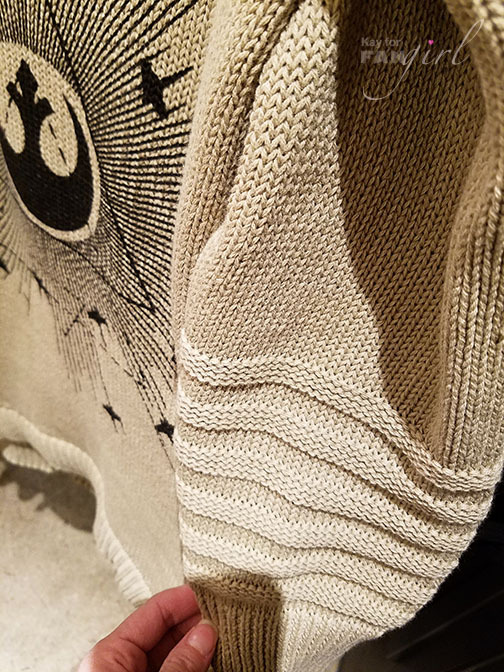 While Bodhi kept his Imperial patches, this dress comes with the same rebel buttons as the cardigan. My favorite part of the dress was its lining. 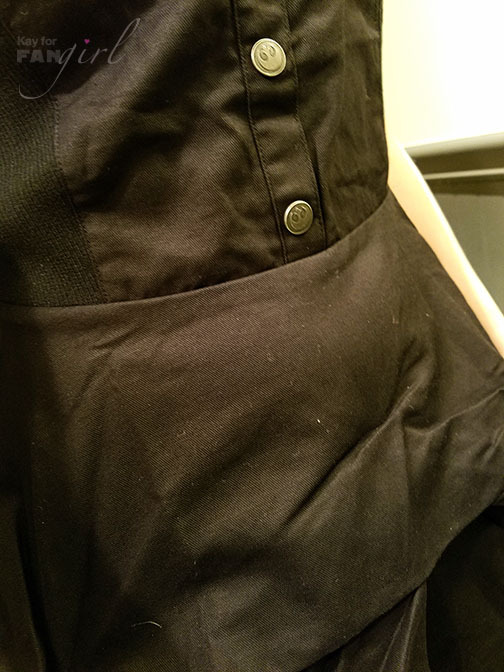 The stretchy fabric sides were a good way to help give a little stretch to the garment, but unfortunately I found the dress to be really unflattering on. 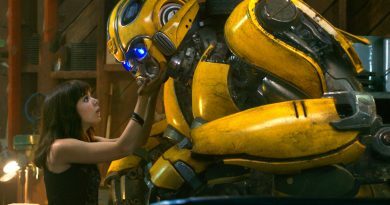 The short parts are really short and the buckles on the straps dress down what looks like could be a bit fancy of a dress. 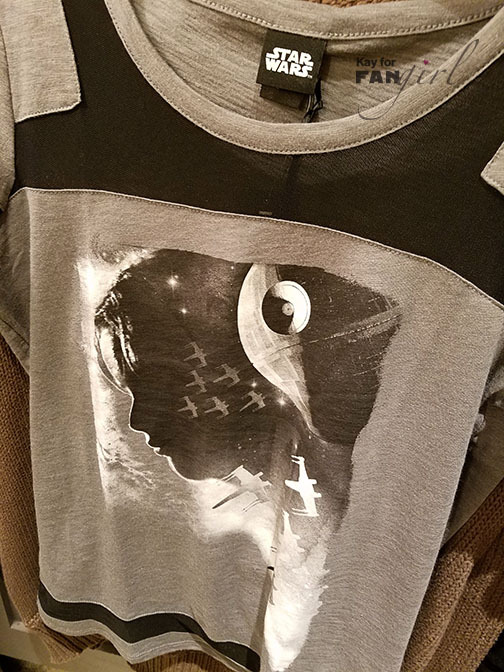 JYN MESH INSERT GIRLS TOP: ($32.90 – $42.90) Another very cool Rogue One graphic design along with the mesh insets make this shirt more fashionable than your average t-shirt. Once I tried it on, I realized the only downside was that you’ll have to wear a strapless bra if you don’t want your bra straps to show through. 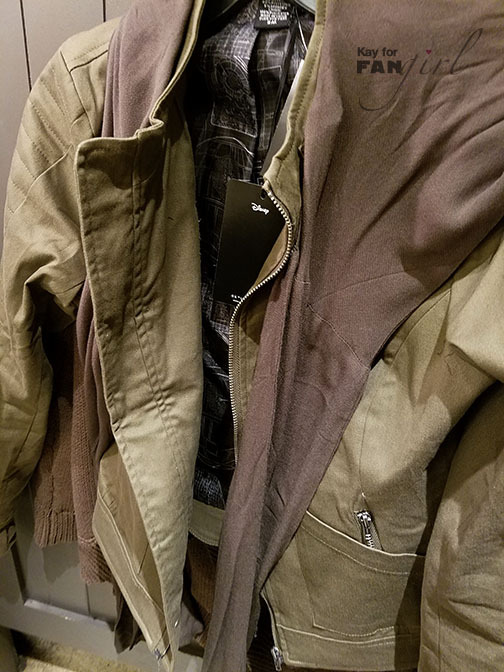 JYN REBEL ALLIANCE JACKET: ($74.90 – $84.90) This jacket was another where trying it on completely changed my opinion of it. It looked pretty plain and boxy in the photos, but once on I came to appreciate the fit and how great it looks with the scarf hanging down. 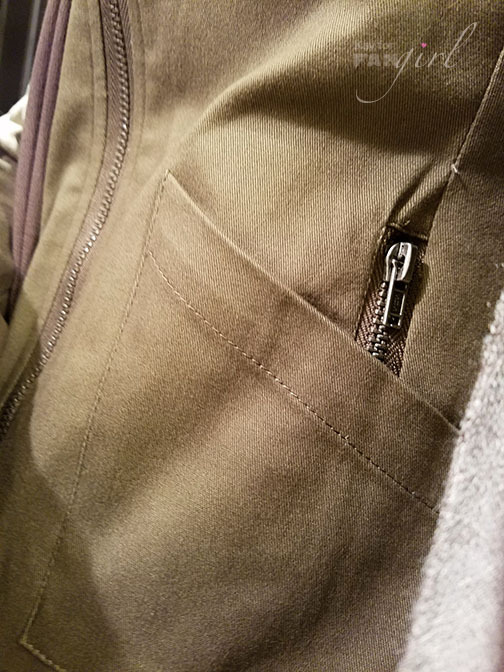 The terrific pockets have zippers to keep your stuff secure despite their angle. Plus the scarf is conveniently detachable. 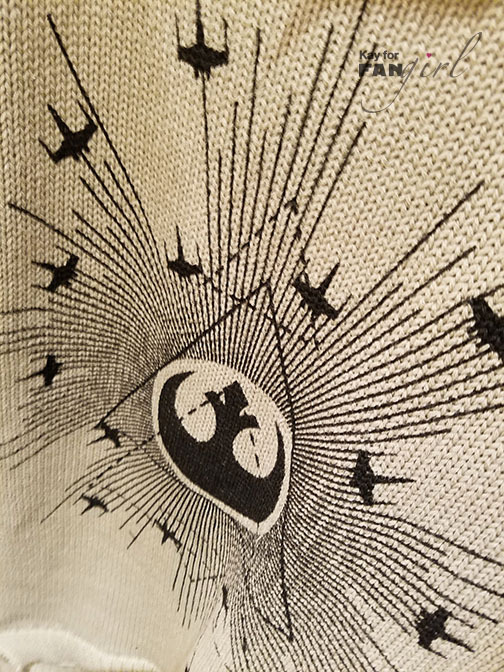 Plus the Death Star plans on the lining is a clever way to have something bold and on-point in such a subtle jacket. This one is hands-down my favorite piece of the collection. Sizing: As usual with Hot Topic these are all in juniors’ sizing. Plus sizing is offered as well but only as an online exclusive. I didn’t have any significant fit issues with any of the pieces and went between two sizes dependant on how I wanted the piece to fit. Overall I went with my usual size or a size up if I wanted more room. 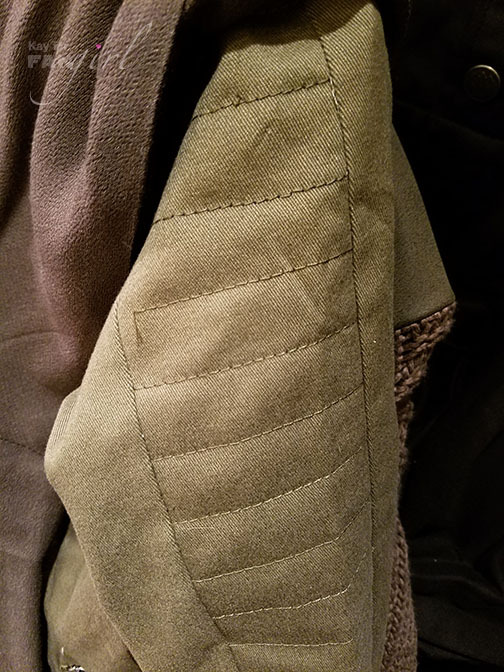 Quality: The jacket definitely felt like the highest-quality piece with the most attention to detail and the nicest finishings. All except one of the pieces are 100% cotton with good breathability. 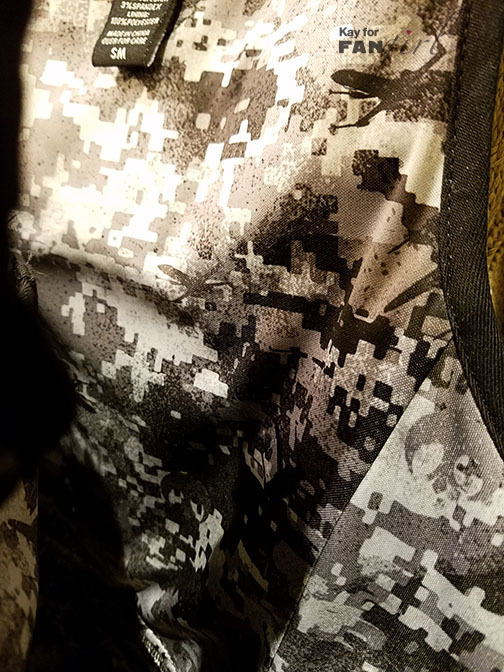 The one non-100% piece is the t-shirt; its cotton-modal blend makes it the softest of the group. All the clothing I looked at had nice hems and well-constructed seams. Availability: From their email announcement, this collection was set to be in all Hot Topic stores, which was nice because sometimes speciality collections are only in “select”. All the clothing was also on HotTopic.com. Unfortunately plus sizes were only offered online, but they were offered. Conclusion: While it’s a top-heavy collection, there’s a good variety of types of pieces. 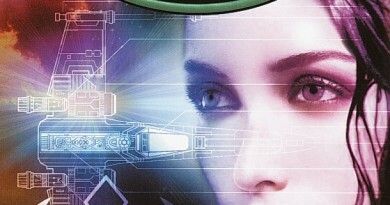 There’s a mix of subtle and more obvious designs. It’s definitely the Rogue One collection that best fit with the movie’s story. You can find the men’s hoodie, t-shirt, button-down shirt, and jacket here. See a few of the pieces I looked at up close in the gallery below. 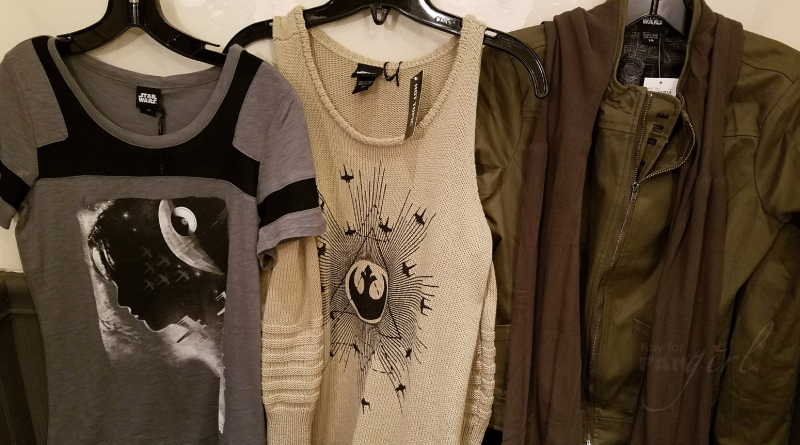 Three of the best pieces from the Rogue One collection at Hot Topic. All photos in this gallery by Kay. 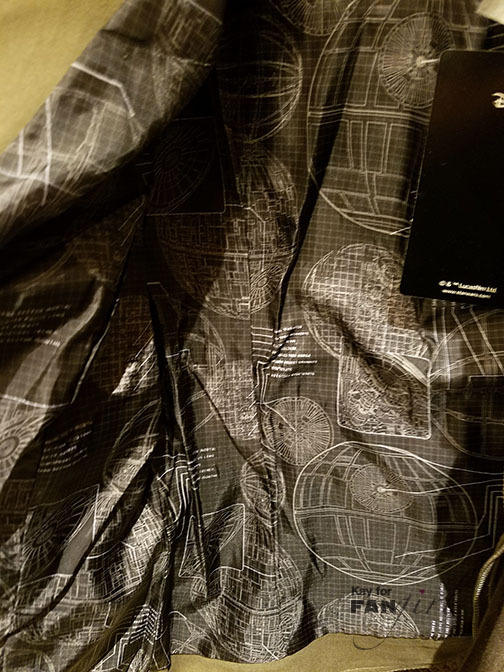 Death Star plans are inside the jacket! All photos in this gallery by Kay. Please do not re-post without her permission. If you’re talking button/pins, Hot Topic has some from time to time. At the moment they only have Funko Pop! 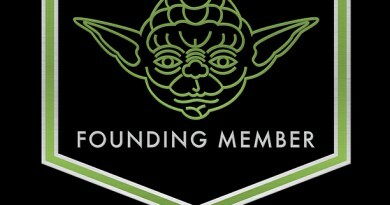 ones on their website. The Disney Store has a bunch currently: https://www.disneystore.com/disneystore/product/search?searchTerms=star+wars+pin And then there’s usually fan-made ones on Etsy. 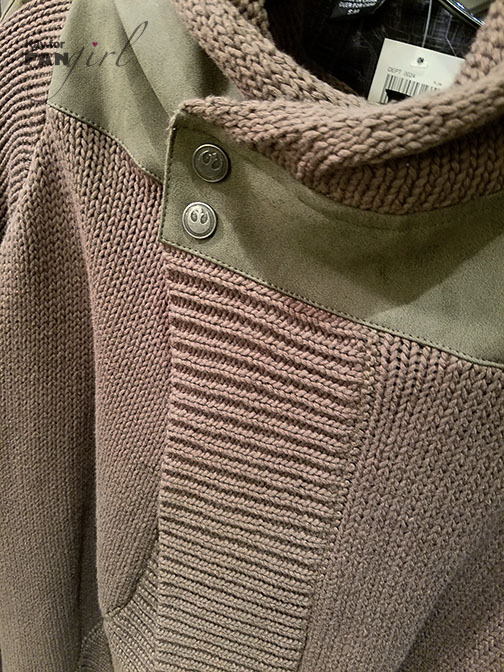 If you’re talking buttons that you’d replace existing buttons on a shirt or other button-up clothing, I haven’t seen anything like that on its own yet.